Their right to claim the $1.8 million prize was set to expire in two weeks. A Louisiana couple preparing to welcome their family for Thanksgiving were cleaning their home this week when they found an unexpected surprise: a winning lottery ticket worth nearly $2 million. Harold Ehrenberg said that he and his wife wanted to go to the lottery office right away to make sure they weren't making a mistake, but it was a Saturday and the office was closed. Tina Ehrenberg said that she "called the winning numbers hotline over and over," a statement from Louisiana Lottery said. 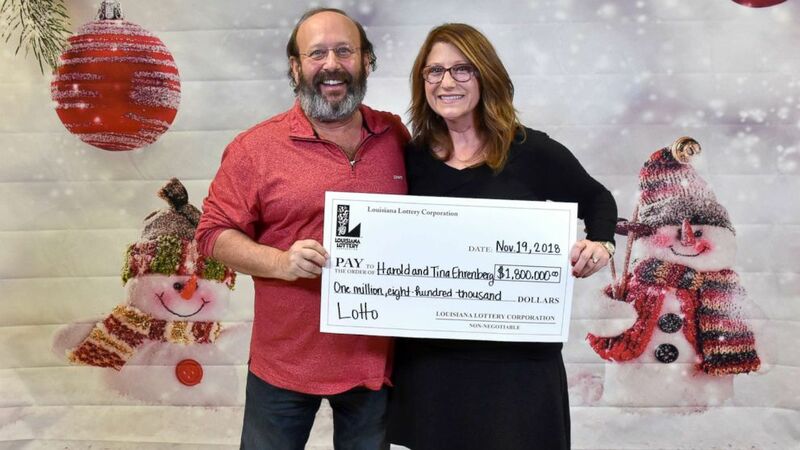 (Louisiana Lottery) Harold and Tina Ehrenberg claimed $1.8 million jackpot-winning ticket on Nov. 19, 2018 after they found the ticket for the June 6 Louisiana Lottery Lotto drawing while they were cleaning their home to welcome family for thanksgiving. "I kept waiting for something to go wrong," Harold Ehrenberg said. But once they were able to visit the office, he said that "they congratulated us and then it became very real."